Bloom Butterflyix. . HD Wallpaper and background images in the The Winx Club club tagged: photo winx club season 7 transformation butterflyix design character bloom fan art deviantart. This The Winx Club fan art might contain bouquet, corsage, posy, and nosegay. UNIQUE!! Darcy & Bloom - "I can't lose you again..."
The Butterflyix you've made looks good. But the concept of Butterflyix seems to me too boring. I think season 7 would be a boring one like season 4. ^ I didn't make this, a user on deviantART did [Bloom2]. I'm not planing on watching season seven either. The shows been going downhill since season five. This Butterflix is so much more chic than the boring Butterflix of Season 7. 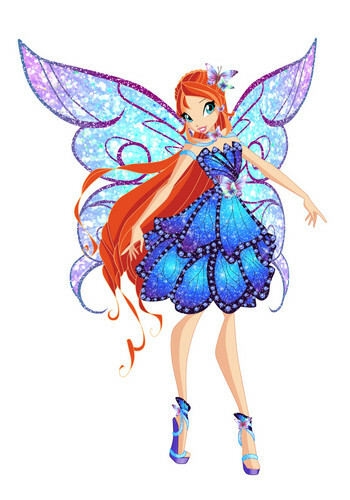 The only Winx that matches Butterflix has to be Flora.